Jersey International Air Show 7 September 2006. 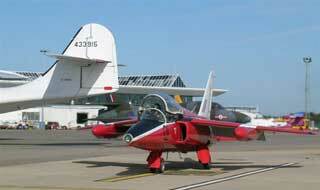 We were approached by the organisers of the Jersey International Air Show earlier in the year. After several e-mails and numerous phone calls we agreed to take Miss Jo over the Channel. This meant that we were going to have to fly over rather a lot of water, better know as ‘blue grass’, not something to be taken lightly in a single-engine aircraft! Arrangements were made to sort out the immersion suits, life belts, salt activated wrist watch locaters and a life raft. 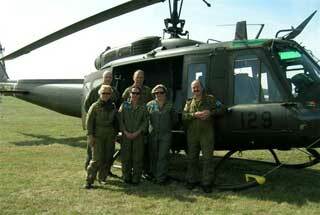 The Huey was down at Redhill, Surrey, having just appeared at the Military Odyssey Show. So the crew, Phil, Simon, Neil and Heather had to drive down. 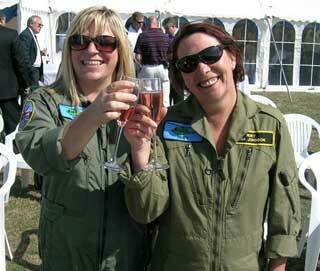 Jo and Nina Johnson (Simon’s wife) opted to fly to Jersey from Manchester care of British Airways! After loading the Huey with all the safety gear and fuel she was ready to lift for the first leg of the flight. Although heavily laden the Huey trimmed well but required more power than usual to rise into the sky. It seemed no sooner had we taken off that we were preparing to land at the Isle of Wight to take on more fuel, (thirsty old thing Miss Jo!) and to sort out the passports etc. Once happy with the paper work we donned the immersion suits and talked through the emergency procedure then prepared to lift, but this time to head out over the Channel. Up to now the conversation had been quite lively but all of a sudden it became almost non existent. We were all concentrating on sighting land on the far side of the Channel and suitable boats to head for in case of problems. Amazingly France was spotted on the horizon within minutes of leaving The Isle of Wight. From 1500 feet you get a good view of what the shipping is like in the Channel, we were not short of suitable boats. We even saw a Royal Navy carrier with a Chinook and Seaking carrying out various exercises off the flight deck. An hour and fifteen minutes after we lifted from Isle of Wight we touched down on Jersey soil. We glad to be able to peel off the sweat suits, I mean immersion suits!! We secured the rotors and locked the doors and left 509 to a welcome rest after a faultless flight. Wednesday we were all up early as this was the only opportunity we were going get to have a look around the island. We decided to visit the HO8 tunnels. What a fascinating place, within it, the exhibitions tell the story of Jersey’s occupation very well. We can only imagine what life must have been like but we came out of the tunnels with a much clearer idea of what the local population and the occupiers went through. In the afternoon we returned to the airport for a pre-display briefing. 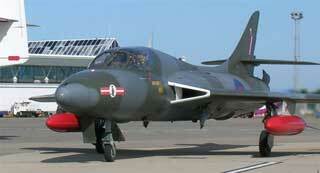 It also gave us the opportunity to have a look down the flight line at the other aircraft that had arrived. Neil and Phil took to the skies again, this time for a trial run along the flying display line. The air display takes place in St Aubin’s Bay, a wonderful natural amphitheatre! The “trial run” allowed them to become familiar with the parameters and visual references for the display. On their return, the crew were treated to a flight around the island! 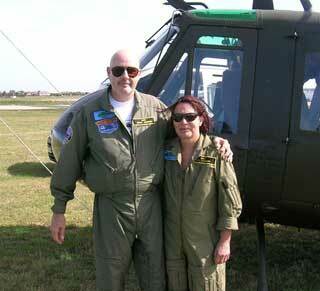 The weather was warm and sunny so we slid the doors open-a great way to fly the Huey, the views were incredible! All the flight crews were invited to a Champagne Reception at the Governors residence. We all had a lovely evening sipping champagne and chatting to the other crews. It was quite an international affair with crews from all over Europe. Thursday, display day, dawned a little cloudy but soon brightened up. Phil and Neil went to the pre-flight safety briefing while Simon, Nina and Jo were invited to watch the display from the VIP marquee overlooking the bay. More champagne consumed!! Heather stayed at the Flying Club to watch all the aircraft taking off. The display went like clockwork. We were sent around the north of the island flying in a holding pattern in the sequence we were displaying bringing us back to St Aubin’s bay. Heading up towards Elizabeth Castle, we were following the T28 Fennec which is also a Vietnam era machine. Once over the castle we dropped low and shot across the bay with a tight banked turn to set us up to thump across the bay with an equally tight turn at the castle end. 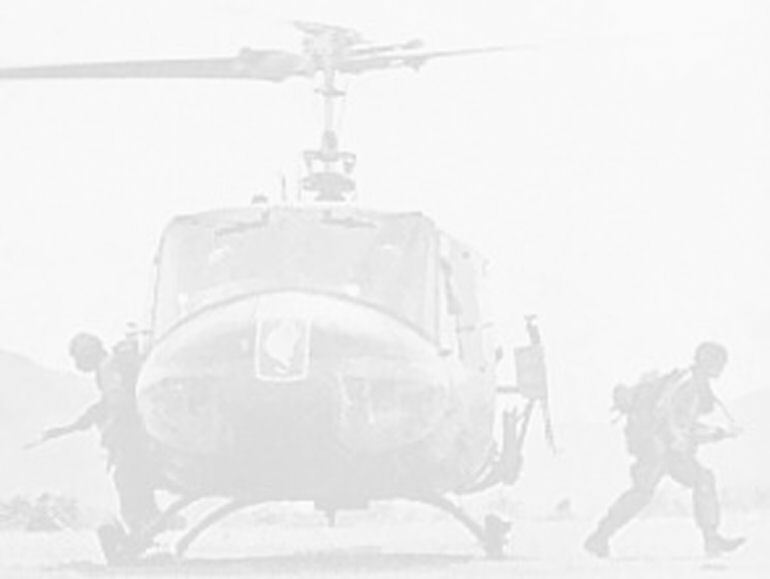 All the time we were conscious that people wanted to not only see Huey but also to hear that distinctive sound as our enormous blades slap the air. By all accounts we didn’t disappoint. We did a total of five passes before heading back to the airport. Before leaving the Flying club we watched the Red Arrows go through their start up procedure and then taxi out to the runway. It was sheer poetry in motion. 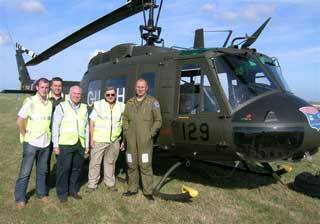 Following their display some of the pilots came over to have a look around our Huey. They were all really interested in it and what we do! The organisers very kindly arranged a post-display party at The Hotel de France for all the flight crews and volunteers. We were presented with a full four course dinner! We shared the table with some of the volunteers who insisted they were just ‘gofers’. It turned out one such ‘gofer’ was none other than Sarah Ferguson, no, not THE Sarah Ferguson, another Sarah, the lady who controls the purse strings to the air show. We had a really enjoyable and interesting evening talking to the very modest ‘gofers’. Friday morning came and we were once again heading back to the flying club. We loaded up and donned the sweat suits again. Nina headed off to the airport to catch her flight back to Manchester. 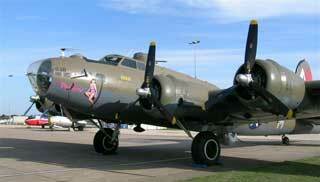 We took off around ten thirty and could see cued up in front of us, the B17 ‘Pink Lady’ and the Catalina. Behind us, flew the Dakota, Hurricane, Spitfire, Lancaster and Mitchell. That was some sight! Our flight back to the Isle of Wight was very uneventful, thankfully, and took a similar time to our outward flight. 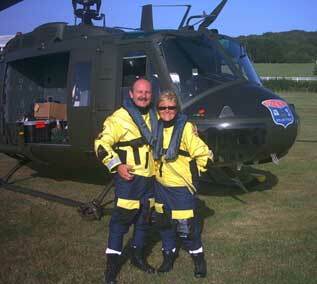 Once again the immersion suits were removed as soon as we could alight from the Huey. We headed north to Wolverhampton to refuel and from there we flew back to Wesham. The weather over the UK was sunny and warm which gave us really good flying conditions On our return we had time to reflect on what was the longest deployment to any show this summer and our verdict……fantastic. We all thoroughly enjoyed it and the feedback from the organisers was that they enjoyed having 509 at the show. Would we go back again? Yes, if they’ll have us back.